This has been an issue fraught with drama in the past. And it’s not hard to see why as Vanity Fair celebrates the 25th anniversary of its annual Hollywood Issue, released always in the run-up to the Oscars, featuring actors who are often in play during award season; a look-back at its previous covers reveals, well, the industry’s blindspots and lack of inclusion. This year’s cover features Chadwick Boseman, Saoirse Ronan, and Timothee Chalamet on the front fold. Then Nicholas Hoult, Yalitza Aparicio, Rami Malek, and Regina King on the second flap. And John David Washington, Elizabeth Debicki, Tessa Thompson, and Henry Golding on the third page. The shoot happened back in November. 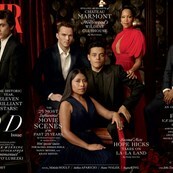 The three actors who ended up with Oscar nominations happen to be in the same section – that would be Yalitza, Rami, and Regina. I appreciate the inclusion of Elizabeth Debicki, for her career-best performance in Widows, which unfortunately did not contend at all this season and it should have. It’s a film that does more than you think and Elizabeth is unforgettable in every one of her scenes. Every single one of these actors has already moved on to their next project or resumed projects they’ve been working on for years, save one. As noted yesterday in the site open, Yalitza Aparicio has just been nominated for her first Oscar in her first film and that film happened to be directed by Oscar-winning and nominated director Alfonso Cuaron. She has yet to book her next role. I wonder, when we revisit this in, like, two years, five years, what the status of that will be and whether or not, big picture, the small pushes forward that we’ve seen will have generated the kind of momentum necessary for real and lasting change. If you go back to the first issue in 1995, an overwhelming number of those actresses went on to big careers. Five of them have Oscars now. Several of them have Golden Globe, and/or Emmy nominations and wins. And check out that third page: Sarah Jessica Parker, Julianne Moore, Angela Bassett, and Sandra Bullock to round it out. On the third page! I’m so curious about how the 2019 success rate measures up. As for the issue and its features, this is meant to be slowly devoured. Or repeatedly devoured. Have you watched the film that was produced in celebration of the milestone? It opens on Chadwick Boseman dancing, in slow motion, the ties attached to his Givenchy shirt swaying as he moves, the suit clinging to him perfectly. It’s a visual body buzz, the best kind of mood. I hope it sustains me all day. More on the Vanity Fair Hollywood issue later once we’ve all had the chance to unpack all the features. For now, I’ll leave you this guy, the tease. He’s just so ridiculously pretty.